Figure 9.20: Block diagram of the system. A gray scale image is generated, with parameters being the number of lumens, location of lumens, the number of classes K, and a Gaussian perturbation with mean and variance. The result is an image with multiple lumens with noise. This image is then processed by the lumen detection and quantification system (LDS). This system includes many steps including classification, binarization, connected components analysis (CCA), boundary detection, overlaying, and measuring the error. The final result are the lumen errors and overlays. generation process takes in the noise parameters: the mean and variance, the locations of the lumens, the number of lumens and the class intensities of the lumen core, the crescent moon, and the background. 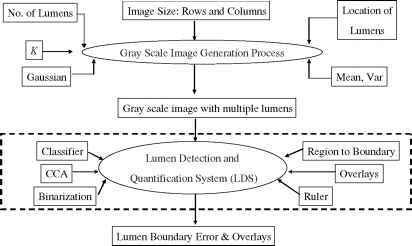 Step two consists of lumen detection and quantification system (LDAS) (see Fig. 9.20). 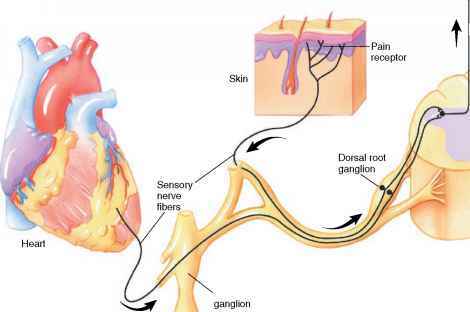 The major block is the classification system discussed in section 9.3. Then comes the binarization unit which is used to convert the classified input into the binarized image and also does the region merging. It also has a connected component analysis (CCA) system block which is the input to the LDAS. We also need the region-to-boundary estimator which will give the boundary of the left and right lumens. Finally we have the quantification system (called Ruler), which is used to measure the boundary error. Figure 9.21: Block diagram of lumen detection system (LDS). The gray scale image with multiple lumens is first classified by one of the classifiers. The result is a classified image with multiple lumens, with each lumen having multiple class regions. 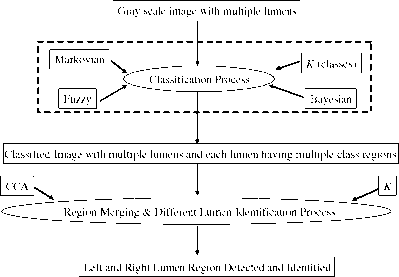 Within each lumen, these multiple regions are merged in the binariza-tion process, given the number of classes K. They are labeled using connected component analysis (CCA). The LDS detects and labels each lumen. processes (see section 9.3). The parameters used are the number of classes (K) as shown in the Fig. 9.21. The CCA block also takes the parameter the number of classes, K, as input. The lumen detection and identification is further detailed as shown in the Fig. 9.22. The detection system inputs the classified image and outputs the binary regions of the lumen. Because of boundary classes and plaque diffusion in the lumen area, there are classes well. We merge these classes to generate the complete lumen and the final detection of the lumen takes place as shown in the Fig. 9.22. Finally, the system shows the identification of the left and right lumen using the CCA analysis.